Hello! Bonjour! Hey there! Hi! Good Evening! 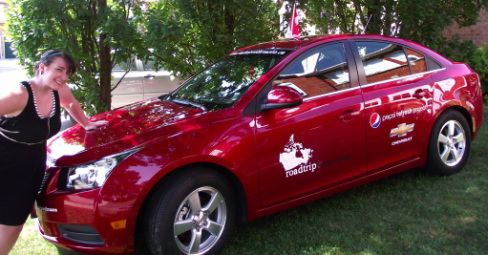 Welcome to Roadtrip with Reason's little home in the blogosphere. Logo designed by Sara Farnell + my face! I was told to write up a little something in anticipation of your arrival, following Roadtrip with Reason's version of the "Canadian Original" segment on CTV National News. 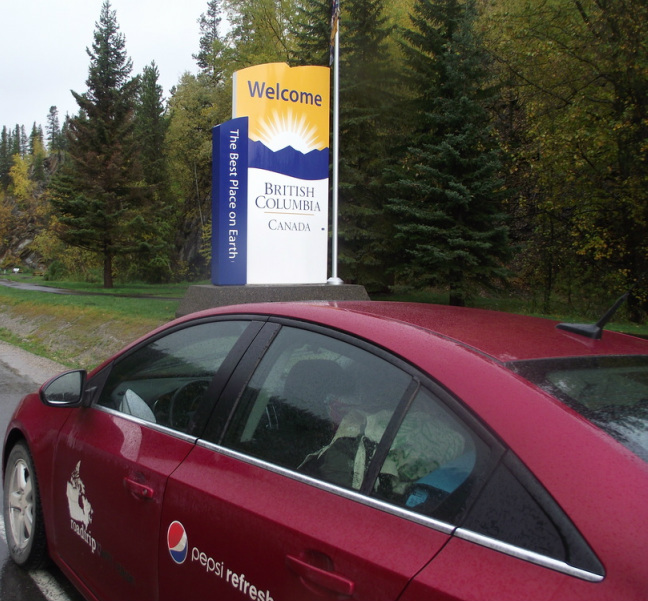 Thank you, so much, for being a curious cat and coming to learn more about my incredible cross-Canada journey that took place between July - November 2011. It's possible that you are visiting my blog for the very first time, so I thought it would be useful to share the roadtrip timeline/milestones with you! Phewf! 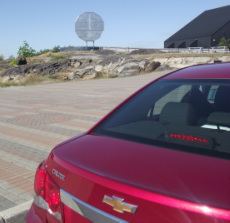 The cross-Canada journey went by in a flash and it was truly an incredible experience. I had the opportunity to join 13 different non-profit organizations and offer my 'helping hands', while also getting to know the staff/volunteers and the reason why they were so passionate about their cause(s). It was an honour to spend time with each of them, and it's my joy to be able to share their messages with you. Some of the volunteer reflections come in video form and since the theft of my laptop/footage , in written form. Be sure to go through my blog history to view some of the reflections, pictures, videos and general updates from my Roadtrip with Reason -- lots and lots of great memories to share. You can also look forward to the final reflections before the new year, and a final video. I have been back home in Ontario for a month now, adjusting to life off of the road and putting the finishing touches on the Roadtrip with Reason reflections. I am now focusing on finding my next professional adventure (i.e. a job!) in the non-profit sector and am so excited to continue on my life quest of creating positive change. Please take the time to visit the websites of the non-profit organizations that joined me on my journey. Their hardwork, dedication and passion for their causes is what should be featured and celebrated - they were the reason for this roadtrip, afterall. I encourage you to "do your part & show some heart" as a volunteer with one of these amazing organizations, or find a cause that you are passionate about and just give back. They need our time, energy, passion and support to keep doing what they are doing, and what they are doing is so worthy. Becky's note: Click HERE to see the clip. Absolutely wild. Thanks for the love! Note: Due to the theft of my Macbook Pro and it's files (all photo/video footage), I have had to adapt the way in which I share and reflect on each organization that took part in the Roadtrip with Reason. You can view a few video profiles that were already posted prior to the theft here . Thanks for your support! After a wonderful Thanksgiving weekend with my family in Victoria (British Columbia), I said my farewells and watched them hop the ferry back to the mainland - leaving just Archie and I behind. I was continuing on to complete the last leg of my cross-Canada volunteer journey and had plans to stick around Vancouver Island to explore. My next volunteer stop was at the Rock Bay Landing Shelter in Victoria, British Columbia. The Rock Bay Landing shelter is an extension of the Cool Aid Society, which is a non-profit organization that strives to "provide holistic shelter, housing, and community health services to adults experiencing marginalization in the Victoria area". The Cool Aid Society began back in 1968 when a "Cool Aid Hostel" (emergency shelter) was established for transient youth travelling the country. Now they run 4 shelters in Victoria, BC - Rock Bay Landing is their most recent addition. I arrived to RBL on a beautiful sunny day in October and was completely surprised to find such a modern, clean, green (solar panels!) and safe space. To be completely honest, I strolled by the building twice just to be 100% sure I wasn't lost. This was unlike any shelter that I had seen before. I later learned that the reason why RBL was so impressive was because it only opened on November 3rd, 2010 and had been a major (and necessary) undertaking for the organization. It's a pretty spectacular building that also hosts equally spectacular staff and volunteers. I was welcomed to RBL by Sarah Hook, the Volunteer Coordinator, and immediately felt my little fears melt away. What a gem! When she was taking me on the initial tour of RBL - laundry, showers, courtyard, activity room, offices, day storage, clothing 'store', kitchen, classrooms, transitional rooms, etc - it was clear that I wasn't the only one who thought she was gem-like. It was nice to see some clients' interactions with staff, and appreciation for the work that they put in on a daily basis. After spending a few days volunteering at RBL, I was more understanding of the realities (& struggles) that the staff do face. It's not an easy task to keep the shelter running so smoothly. Not an easy task at all. As a volunteer, some of my roles were to sort donations for the shelter 'store' (clients are able to take a limited amount of clean clothing for themselves), do shower sign-in/out (& hand out towels/toiletries), prepare lunch and dinner services (with the creative head-Chef's who make delicious & nutritious meals with limited resources), serve meals to the clients, assist with an arts workshop, and complete room-checks (clients have to leave their rooms during the day for janitorial staff) ... but my favourite part of the experience was engaging with the clients. I learned a lot about the stigmas surrounding people who use services provided by the Cool Aid Society. I learned that there are families living there, teenagers, adults, mothers, seniors, addicts, full-time employees, immigrants, couples, victims, runaways, volunteers, people with mental health issues, and everyone else in between. I learned that these clients love art, hockey teams, cooking, playing soccer, going to the movies, their hometowns, holiday celebrations and fireworks. I learned that they are educated, plan to get educated and have dreams just like the rest of us. I learned that the people at Rock Bay Landing are exactly like you and I. They are human, after all. At the end of my time with Rock Bay Landing, I concluded that although it's a 24-hr co-ed shelter space, it looks and feels more like a University residence. This is a really great thing, in my opinion. It's a home - a place for memories, tears, struggles, overcoming obstacles, sharing meals, friends, family, motivation, successes and hope. Everyone needs a place to call home, even if it's only a short-term fix. My experience at RBL reminded me of how lucky I am as an individual, and how lucky we (as Canadians) are to have dedicated staff/volunteers who work so, so hard to offer support to those who really need it. I sincerely hope that one day RBL is no longer necessary, but until that day, I am grateful to know that the Cool Aid Society is there. 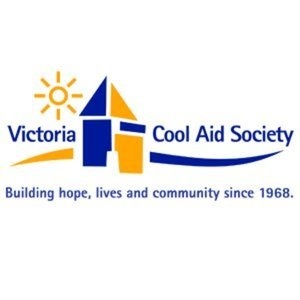 For more information on the Cool Aid Society, click here ...and if you're in the Victoria area, I encourage you to check-out their Christmas initiative "homeless partners ". Note: Due to the theft of my Macbook Pro and it's files (all photo/video footage), I have had to adapt the way in which I share and reflect on each organization that took part in the Roadtrip with Reason. You can view a few video profiles that were already posted prior to the theft here. Thanks for your support! While planning my Roadtrip with Reason, I connected with Jay & Sharon from Service Driven on Twitter. These two have been journeying across the United States (mostly) since February 1st 2011 - volunteering their time and enjoying as much beer/bacon/bikes as possible. Naturally, our projects had a lot in common. In June of 2011, they were passing through Ontario and stayed the night at my apartment in Bracebridge where we discussed their journey, my upcoming journey and Jay’s (hilarious) fear of moose. A month or so later, they sent me an e-mail about The Muskoka Foundation and the ball got rolling. The Muskoka Foundation is an organization whose vision is to “to create a network of hundreds of modern day explorers, traveling overland in communities around the world, using their professional skills to do good as they go.” They provide the ‘traveling participants’ with programming framework, tools and support to help carry out activities while on the road. I was sold! Plans were made for September to have me volunteer at the Napi Friendship Association (NFA) in Pincher Creek, Alberta. I arrived to Pincher Creek without knowing very much about the place. 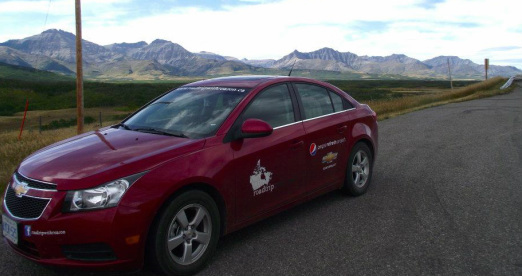 It turns out that Pincher Creek is a small ranching town (approx 3,370 people), directly east of the Canadian Rockies. 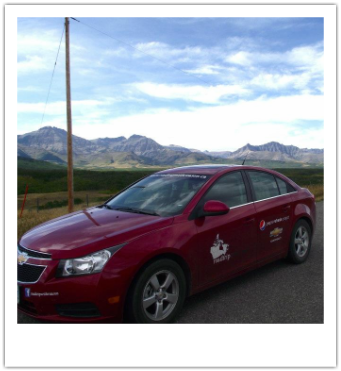 It is known for its strong Chinook winds (& subsequent wind turbine development), surrounding aboriginal communities, and close vicinity to Waterton Lakes National Park. I met with Earlene (the Youth Coordinator at NFA) to discuss my volunteering plans for the week and was equal parts nervous and excited. Prior to this experience, I hadn’t had much direct exposure to aboriginal culture and was unsure of how I would be received. No issues here! We decided on a video blogging project for the participants – the plan was to work collectively to create a video about what living in Pincher Creek (or on the Pikkani Reserve) meant to them. The girls in front of the pinchers! After strolling around Pincher Creek and making visits to all of the “hot spots”, their school, the trails, some family/friends etc for photos and videos; we warmed up to each other and questions began flowing back and forth. I was extremely curious about their daily lives (typical teens), how their culture played a role (big role), their experience living in this little part of Alberta (not too bad), any racism/prejudice they experienced (some) and their hopes for the futures (lots). They seemed to be equally curious about my project, why I was doing it, what brought me to them and how life was on the road. The day ended with all of us taking beautiful footage of the prairie land, while the sun was setting over the Rockie mountains in the distance. It was a stunning sight (prancing deer included) and I got the sense that these three were more proud of their home than they had originally expressed. The following day was deemed ‘editing day’ and I showed up to find no one there. Ouch! It turns out that there was a family wedding and some miscommunication with Earlene – she had forgotten that it was a PA Day, which meant that the girls didn’t have transportation from their home on the Pikkani reserve to Pincher Creek. Regardless of the reason, I was disappointed and felt like I had failed as a volunteer/workshop leader. I spent the rest of my afternoon at the Napi Friendship Association uploading/sorting through the hours of footage and began the editing process. I was about a quarter of the way done when the centre was closing. The completed video was too large for online file sharing, so I had intended on sending it to the girls via snail mail. Unfortunately, the video didn’t make it to the girls before the theft my laptop. Another project lost! Although my experience at the NFA was not ideal or perfect, it still was put on the “meaningful memories” and “what I wouldn’t have done before” lists. I learned so much about Aboriginal culture (something I am very interested in) and was shown so much kindness by the staff, particularly Earlene who lent me her couch for those nights. I wish that I could’ve shared more experiences with more participants, taught them more about the uses of vlogging/social media and had more of an affect, but what can you do? Earlene kindly reminded me that by sharing my own roadtrip journey with the girls, I was positively influencing them and showing them that their dreams are achievable. I don’t know if that is actually the case, but it felt good to hear at the time. Following the time of volunteering and at the advice of the NFA staff, I decided to spend the rest of the weekend camping at Waterton Lakes National Park (about 50km away from Pincher Creek). I drove towards Waterton Lakes feeling a little disheartened and blue, but ended up finding one of my most favourite places across Canada – a place that I hadn’t even heard of prior to my visit at NFA. One of the ‘Elders’ in Pincher Creek had told me of the Waterton's long spiritual history in providing needed energy and ‘warmth’ to its visitors. Funny how things work out! I am so grateful to the Muskoka Foundation for organizing this experience for me. I am absolutely in love with the actions they are taking, and what they are promoting through their organization. I look forward to using their services on one of my future adventures! For more information on The Muskoka Foundation, go to their website HERE. You can also purchase a 2012 Nature Calendar, full of beautiful photographs taken by youth in their volunteers’ workshops. 100% of the sales (above costs) go back to the host communities and their youth. I made a stop in Saskatoon, Saskatchewan while on my Roadtrip with Reason and was thoroughly impressed. 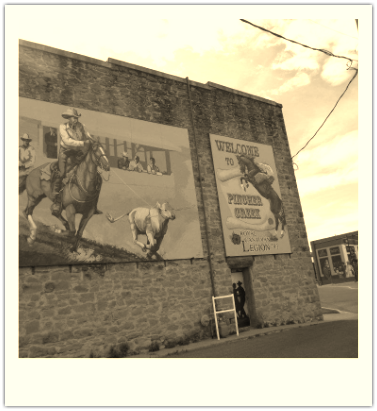 It's a little prairie city with a big prairie personality, and one that showcases a lot of diversity. I was extremely surprised (and puzzled) to discover representation of so many cultures in Saskatoon, until I later learned that Saskatchewan is "making efforts to attract at least 5000 newcomers each year to contribute to its growing economy." Ah, hah! Puzzle = solved. I had made plans to volunteer with the Global Gathering Place, a "non-profit drop-in centre that provides services for immigrants and refugees in Saskatoon." The reason for their existence (in Saskatoon) became much clearer once I was introduced to this culturally diverse city, placed in the Canadian Prairies. The Global Gathering Place (GGP) are committed to providing “holistic, adaptive and person-centered services to support the efforts of refugees and immigrants to overcome challenges and participate fully in Canadian life as equal members.” They also “educate the public about refugee immigrant issues, address misconceptions, and highlight the valuable contributions that refugees and immigrants make to our community.” Essentially, they act as a support system for immigrants and refugees by creating a community-like atmosphere and by offering programs and services that help them adapt comfortably to their new home. From the planning stages of the Roadtrip with Reason, I knew I wanted to include an organization that dealt with diversity in some way. Diversity plays an extremely important role in defining Canada and I felt that it was a necessary subject to cover. The Global Gathering Place was the perfect fit! One morning I arrived to a classroom, knowing that I would be volunteering to help the Instructor with her English Level 1 class. There were approximately 10 students, probably between the ages of 30 – 70, who were newcomers to Canada and were proactively trying to learn the language. They were all from different countries, different educational/professional backgrounds, and were at different levels of English skill. The similarity between every single one of them was the amount of hard work they were putting into the class, the frustration they displayed when they would make a mistake, the pride they felt when they did well on an activity, and the absolute desire to master the English language. As the girl who did very poorly on her Spanish Level 1 in University (who, me?! heh), I really appreciated their commitment and overall attitude to what was clearly going to be a serious challenge. It is also important to mention that they were incredibly genuine and sweet human beings who were so excited about their new learning opportunity. I left the class hoping that they would eventually succeed and lead a happy life here in Canada. Some of the Cooking class! I also took on the (extremely fun) task of assisting with the first cooking class of the year. Myself, the instructor and the 15 participants sorted through the recipes as a group and chose our favourite main course, salad and dessert – which were all going to be made during their following classes. It was really interesting to sit down with a group of people from all over the world and talk food. Many of the participants were curious about ‘Canadian’ food and had a good giggle over some of the recipes, which sounded so foreign to them. They also shared great stories of eating their favourite meals from home, and by the time we were heading out to the grocery store, I felt really comfortable with my group. Who needs to worry about language barriers when food is the subject? It’s an international language, it seems. We all went over to the local grocery store with a task of finding the items necessary to create the meal. I had never thought about how difficult grocery shopping would be to someone who had no experience in a big-box store. Some of them had journeyed to this grocery store already, where as others (who had only been in Canada for a very short period) had steered clear and were baffled by its size. Many of the people in my own group spoke reminiscently of shopping at little markets, but were also so excited to find items from home in the ‘International’ section. Overall, it was a successful shopping trip and I am sure they had a great time cooking (& eating) their recipes in the following class. Spending time at the Global Gathering Place was one of the volunteer experiences that affected me most as an individual. Each participant that I met showcased so much bravery, strength, excitement, and pride for their Canadian journey. Because I was on my own (and very different) Canadian journey, I was humbled by their determination and inspired by their willingness to conquer the challenge. I left feeling so grateful to live in a country where diversity is encouraged, and for places like the Global Gathering Place who help newcomers feel at home in their new home. This experience served as yet another wonderful reminder as to why I am so proud to be Canadian. For more information on the Global Gathering Place, please visit their website HERE. For the first time in my 24-years of living, I journeyed to Winnipeg, Manitoba. People who had made the trip before had given me their not-so favourable opinions. In my first few days as a visitor, I was beginning to fear that their not-so favourable conclusions were true, but then I found Winnipeg Harvest. Winnipeg Harvest (WH) “is a non-profit, community-based organization committed to providing food to people who struggle to feed themselves and their families.” They opened their doors in 1985 and have since been striving to not only feed the hungry, but are also working towards finding long-term solutions to hunger and poverty in Manitoba. Meghan Pesclovitch (Volunteer Services Coordinator) took me on a tour of the fantastic WH space and shared some scary statistics, before putting me to “work”. 2. Last year 51% of food bank recipients were children. I had never experienced the fear of going hungry (thankfully), and had definitely never been exposed to such staggering numbers. I was ready to offer my helping hands more than ever, and was wishing that I had the ability to help on a much larger scale. While volunteering with Winnipeg Harvest, I ended up with two main roles. Firstly, I assisted Dave, a long-time volunteer, in taking phone calls from clients who were in need of emergency food. There were about 6 other people in the room answering calls for the same reason, and the phones never stopped ringing. Because I was not trained, I mostly sat in silence and listened while Dave made the appropriate responses. I was extremely impressed with the efficiency of their tracking system to ensure that no one was taking advantage of the services provided by Winnipeg Harvest and their 320+ partner agencies. One phone call really struck me. A single mom, who was a first time caller, was looking to make an appointment with her local agency because she was almost out of food for herself and her two children. You could hear the panic, stress and absolute fear in her voice. After Dave booked an appointment for her (while also offering some encouraging words), we hung up the phone and I asked him how he felt about his role at Winnipeg Harvest. He made it very clear that although he feels great about being able to calm clients’ fears and help them feed their families, he ultimately wishes that he didn’t have to be there at all (meaning that no one would be going hungry in Manitoba). I heard the same statement over and over from staff and other volunteers throughout the day. I also had the chance to help a team of volunteers sort food donations and put them in their appropriate boxes (I wish I still had my pictures, the efficiency of this place was truly incredible). It was here that I saw the magnitude of food that was being donated, sorted, packed and distributed on a daily basis. It seemed that the WH fleet of trucks never stopped coming to pick up more pallets of food. While taking on this task, I casually spoke with the other volunteers to learn why they chose to give their time to this particular organization. I was surprised to find out that many of them were clients of Winnipeg Harvest and just wanted to give back. I later learned that more than 50% of volunteers at WH are people who use a food bank. My time at Winnipeg Harvest was short, but really eye-opening and impressive. I left the building with an overwhelming sense of gratefulness for my own circumstances, and appreciation for the hardworking group at WH. Every single staff member and volunteer displayed so much passion and were 100% committed to fighting this issue. Fighting hunger and feeding hope. 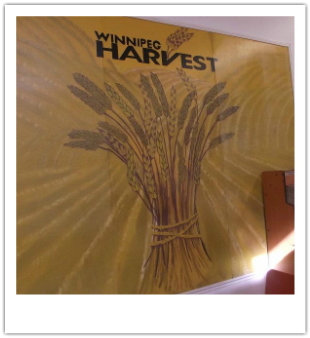 To learn more about Winnipeg Harvest, please visit their website HERE. I also encourage you to read "the Myths" about hunger HERE. 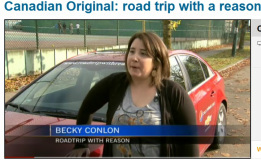 Check out a beautiful newspaper article about the Roadtrip with Reason! 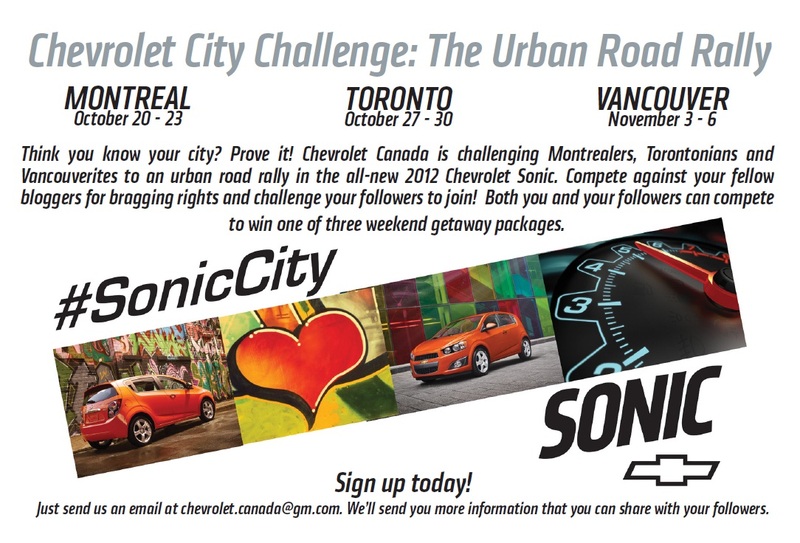 It was posted on November 16, 2011 in The Province (Vancouver, BC). Much love and thanks to Lisa Calvi & also to Garry Sowerby for their ongoing support. Ah, the Ottawa Folk Festival. What an experience! I was particularly excited to share my footage from the Ottawa Folk Festival (OFF) because there was simply so much to share. I spent four full days volunteering, participating, engaging and soaking up the amazing energy that was flowing within the festival gates. Hog's Back Park in Ottawa. Teens, boomers, little kids, seniors, twenty-somethings, friends, families, musicians, volunteers, artists, activists, foodies and everyone else in between. Smiling faces - thousands of them. Beer lines. Taco trucks. Lemonade stands. Bicycles. Water stations. Re-usable plates. City and Colour, Matt Costa, Basia Bulat, Vance Gilbert, Madison Violet, Sean McCann, The Little Stevies, Colin Hay, Steve Earle, Rural Alberta Advantage, The Wooden Sky, Kim Mitchell & many other amazing talents. Volunteers in their blue shirts, everywhere...running every aspect of the show! Emily Addison, the Community Engagement and Volunteer Manager, put me on the 'Photo Crew' which meant that I had the freedom to roam the Festival and capture everything on video. This also gave me the opportunity to offer my helping hands at different stations along the way. I got my shirt dirty with the EnviroDish crew (cleaning re-usable meal dishes), prepped and served fresh food with the Festival Kitchen crew, roamed with the Green Team while we collected and sorted recycables, sat at the Info Booth and answered questions, sold tickets to support the festival with the Raffle crew, checked-in bicycles at their lock-up station, and even attempted to get some decent shots on Photo Crew. 600+ volunteers worked non-stop throughout the festival weekend (and the months beforehand) ensuring that every detail was covered. In addition to the tasks that I was involved in, there were also crews dedicated to Production, the KidZone, Hospitality, Parking, Instrument Care, Safety & Gates, Surveying, Social Media, Floaters & manning Volunteer HQ. From my observations, the entire festival was extremely organized and ran like clockwork. It was an absolute success in my eyes. 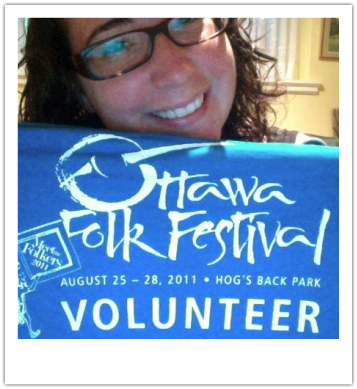 The Ottawa Folk Festival is a "non-profit volunteer-based community organization which celebrates the creativity of musician, dancers, artisans and storytellers through an annual festival", and volunteering with them was a very unique experience. Before I arrived to the festival site, I questioned my decision to include OFF as part of the Roadtrip with Reason - I wasn't sure how to deal with comments like "They put on a festival. Who cares? Do they do anything worthy?". By the end of Day 1, I wasn't questioning anything. So the Ottawa Folk Festival isn't saving lives. Who cares?! Their focus is bringing communities of people together - the community of Ottawa, musicians, artisans, children, seniors, activists, music lovers and everyone else that takes part in the festivities. I spoke to hundreds of volunteers and participants throughout the weekend and heard over and over that "the festival is important", "it supports the arts community", "it supports community development", "it brings my family together", "it's just an amazing event" and "it's absolutely worthy". You can't argue with the crowd! I often pose the question to people (while interviewing), "What 3 words would you use to describe (insert here)?" - I asked myself that same question for the Ottawa Folk Festival. Now that I know what it's like being a part of the music festival experience, I look forward to being a volunteer for life. Many thanks to the Ottawa Folk Festival for introducing me to the festival world and for being such a memorable part of the Roadtrip with Reason journey. 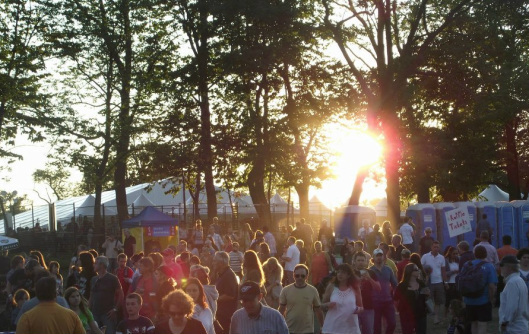 For more information on the Ottawa Folk Festival, check out their website HERE. Note: This is an excerpt that I took from an e-mail I sent to my mailing list. On Monday, October 31st I arrived back to the Vancouver area and spent my afternoon at the Burnaby Metropolis Mall preparing for my 'big interview' the following day (see details after this story). I left the mall around 5:30 p.m. and drove to Vancouver to have dinner with my big brother, James and then headed back to his house in Burnaby for the night. As I parked in his cul-de-sac and opened my back car door, I realized something was very wrong. My blue Pepsi Refresh Project laptop bag and it's contents were no longer hidden underneath my sleeping bag. After a mild heart attack, a phone call and a few obscenities, I determined that my laptop had been stolen from my car. It's a mystery to me how it actually happened because I am overly careful about locking Archie -but there was zero damage to the car (thank goodness) - so it seems I had left the car unlocked, or the thief was a magician and/or a professional (mall security informed me that that is very much a possibility). Whether it was partially my fault or not, the conclusion is the same - my brand new 13" MacBook Pro is gone - as is my Go Pro HD Camera, most of my cross-Canada postcard collection, some important cords, a special notebook that was a gift from a friend and worst of all, my entire project. ALL of my video and picture files, notes, contacts, schedules, budgets etc were on the laptop. My entire project has been lost. I am obviously extremely distraught over the loss of 4-months of ideas, memories, stories and hard work. I feel terribly guilty that all of the organizations who have been so supportive will not receive any footage that was taken. I do promise to share their messages though, just in a different form. You can still look forward to posts about each organization, my volunteer experiences and the completion of the roadtrip in the coming weeks.